The US dollar has topped out with its spectacular recent spike followed by a five per cent crash on Wednesday. That’s the conclusion of HSBC today, although something like the bankruptcy of Greece could still push the euro underwater again. So where do currency speculators turn to next for a momentum trade? There’s an increasing number of professional money managers who think it will be gold which has been trading more like a currency than a commodity recently. If the dollar is no longer king then gold looks like a worthy successor. Even the spot trading is conducted for gold on its current price and it offers a diversification from all other commonly traded market commodities. This post further reveals the inverse correlation between gold and dollar and historically, gold has moved independently of stock to be traded out of the bond market prices as well. For a start gold is at the bottom of a correction of more than three years and attractively priced for an upward move. It topped out at $1,923 in October 2011 and seems to have bottomed out around $1,150 an ounce. Gold has actually held up very well with the rise of the US dollar and came second only to the dollar last year in performance against all other currencies. Certainly the many retail owners of gold in Germany have felt its benefit in protecting them from the 25 per cent depreciation of the euro. Indeed they have profited from it. 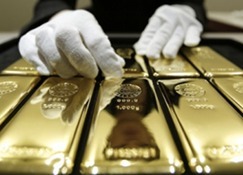 On Wednesday gold went up two per cent and the dollar crashed by five per cent before rebounding. The best trade was selling the dollar and buying gold. Traders are always keen to spot a new opportunity. They create the momentum that carries prices higher. If the dollar has topped out and is now on the way down then gold is coming off its recent bottom and going up. Gold has actually been tracking the US dollar’s advance but it has now decoupled and should go in the opposite direction. Gold is after all the classic hedge for dollar weakness. There’s another reason to think the price of bullion will surge from here. The argument that higher US interest rates are coming is what has kept the price of gold down. That’s what the Goldman Sachs’ research department has been telling us. Now that the Fed has taken its foot off the pedal for interest rates therefore gold prices should no longer stay low. And once investors wake up to the fact that interest rates are actually going to stay low for much longer then logically gold prices should be heading up and up. A Greek exit from the euro and national bankruptcy may also be finally about to happen. That’s a hugely positive event for gold as a safe haven asset. Where else do worried Germans park their cash in a euro crash? Gold is about to have its run as a speculative currency vehicle as the ultimate money that no central bank can print. When currency markets give up on central bankers where do they go?